The Oilholic finds himself in Houston, Texas once again, feeling the pulse of the oil & gas market and catching-up with contacts old and new. But on this latest visit, yours truly has also picked up a new whiff of green! It seems the US oil capital's efforts to lower its carbon emissions and flag up its green credentials are bearing fruit in more ways than one. Some of the ongoing efforts are not immediately apparent to outsiders. For instance, energy efficiency codes for the city's many skyscrapers have been completely redrawn and revised upwards as the Oilholic realised after stepping inside a few and have it confirmed by contacts. More importantly, despite the new codes being non-mandatory for commerical establishments, most – including some of the largest oil companies in the world with offices here – have adopted them up and down Main Street and beyond with much gusto. 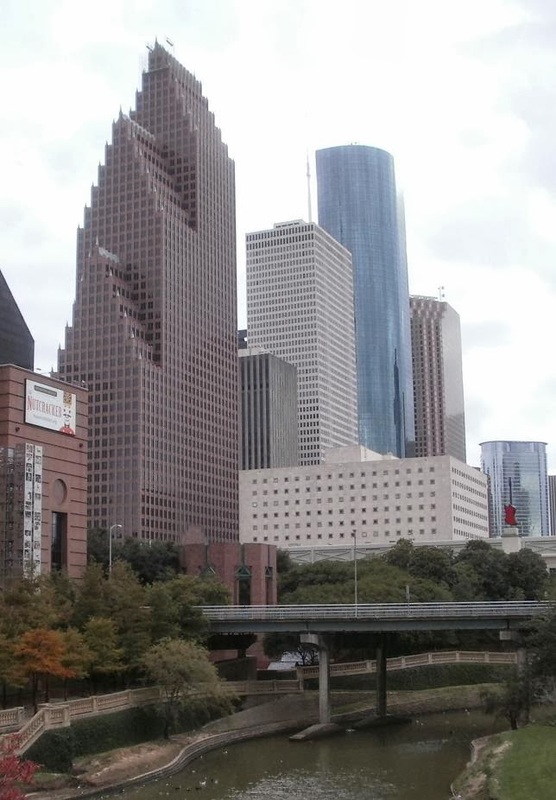 Here is something even more surprising, and one had to double-check with the City's Directorate of Sustainability and a contact at the EIA – the Houston Metropolitan Area is indeed the USA's largest municipal purchaser of renewable energy. Furthermore, over a third of it is sourced locally from Texan wind farms whose state-wide number alone exceeds many European countries taken as a whole. 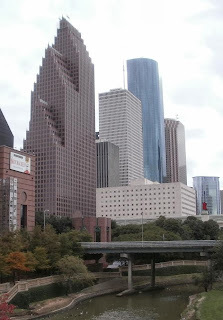 Moving on to efforts that are clearly apparent, the Oilholic noted a few this afternoon having criss-crossed Downtown Houston on foot going left on Dallas Street from Main Street, turning on to Bagby Street and then right back up on Prairie Street in the other direction. For starters, a bike sharing programme has been underway since May 2012. While still in its infancy, Houston's answer to London's Boris bikes is commendable. 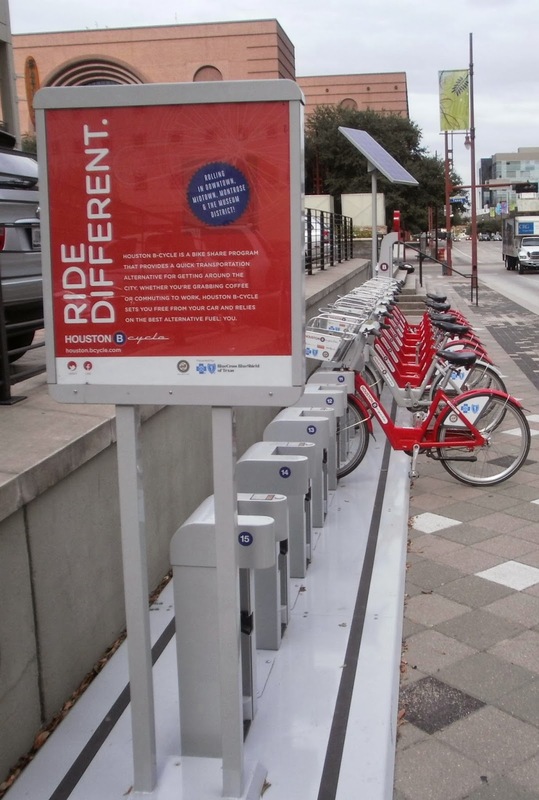 Under so-called the Houston B Cycle initiative, riders can provide their details online, purchase and get on-ground bike shares in Downtown, Midtown and the Museum District. Even some of the docking stations are solar powered (see photo right). Away from the programme, the City of Houston offers over 300 miles interconnected bikeway network spanning across 500 square miles and most public transport vehicles are 'bike storage' friendly. Moving on from two wheels to four, more than half of the 10 or so official city vehicles spotted by this blogger were – hear this – either electric or hybrid. Courtesy a partnership between the Downtown District, BG Group and Houston First Corporation, you can also see GreenLink buses zipping by (see below left). Around seven of these circle the Downtown area, running on CNG and you can ride on them for free! Houston Metro's light rail line, started in 2004, is fast expanding and adding three new lines. A farmers' market comes into town every week to sell locally sourced produce. And finally, a chance encounter with a Centerpoint Energy engineer at a downtown bar, led to another discovery that 75% of the traffic lights in Houston use LED bulbs! The city's criss-crossing freeways, erratically scattered green spaces and rush hour traffic often disguise the effort it has made to go green over the last 10 years. The fact that it is the USA's fourth largest city and its fifth largest metropolitan area (atop being Texas' largest) with some 6 million-plus inhabitants, makes the progress made even more noteworthy. In 1999, Houston was the city with the dirtiest air quality in the country; today it is outside the worst ten, according to the American Lung Association. One mute point though, which makes a lot of this blog's Texan friends chuckle – it seems eight of the worst ten cities in terms air quality are from 'green' California. One apiece from Indiana and Pennsylvania make-up the rest! What the Oilholic has catalogued above has been achieved in a short space of a decade. So here's to the next ten say locals. That's all for the moment from Houston folks! More soon, keep reading, keep it 'crude'! © Gaurav Sharma 2013. Photo1: Skyline of Downtown. Photo 2: Houston B Cycle docking station at Bayou Place. 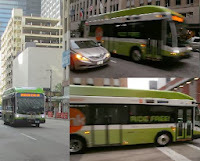 Photo 3: GreenLink buses collage, Houston, Texas, USA © Gaurav Sharma, November 2013. The Kurdish question & a ‘Dudley’ sin?